Ketec Solosensor EAS System for clothing retailers at Affordable Alternatives, Inc. This is a hard tag only system. By following the rule-of- thumb "hard tags for soft goods & soft tags for hard goods," you see this system is best for clothing & soft goods retailers. It designed to for morning setup by a female owner or manager & begin to pay for itself the same afternoon. Remove it from the box, attach it to the baseplate, position it about 12 to 14" from the jamb side of the exit & plug it into the nearest standard grounded 110V outlet. If you can not reach the outlet with the cord provided, do not use an extention cord. Please call a licensed electrician in your city or town to install a standard grounded 110-115V outlet about 6 to 8 feet from the jamb side of the door. Click on the Solosensor below to view 2 installation diagrams. This solosensor makes dollars & sense for all clothing retailers, even in remote areas. Easy to install & use this system will pay for itself in just a few months. It stands 60" (152.4cm) tall, 14" (35.6 cm) wide, & 1" (2.54 cm) deep, & weighs less than 11 pounds (4.8 kg). It will detect a full size tag up to four feet on either side, or a mini-tag up to three feet on either side. Since each monitor works independently, you would still be protected, if a single monitor was incapitated. Just erect traffic control for that zone & continue serving your customers. <---Click on solosensor to view 2 installation diagrams. Mini tag for use with Solosensor single pane EAS system for clothing & soft goods retailers. 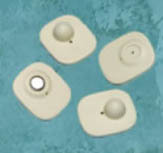 Hard tags & pins for use with the Ketec Soloserve EAS System for clothing & soft goods retailers.